<?xml:namespace prefix = st1 />In the opening section we learned that Nang Rong is a district in Thailand. Where exactly is Thailand, and more importantly, how do we get there when we want to ask questions of some of the people who live there? This section answers these and other questions about the location and geography of Nang Rong. 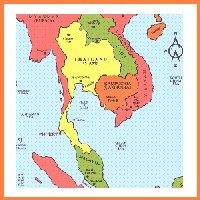 Thailand is located on the Southeast Asian peninsula, a large extent of land jutting into the South China Sea. 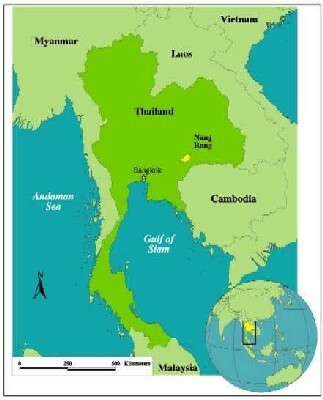 Other countries on the peninsula include Burma, Vietnam, Laos, and Cambodia. It takes a member of our North Carolina research team nearly two days to get from the United States to Nang Rong. The trip begins with a series of flights lasting twenty-two hours! These long flights only get us to Bangkok, Thailand's capital. From there, it is a trip of several hours to the northeast by bus or car to Buriram Province where Nang Rong District is found. 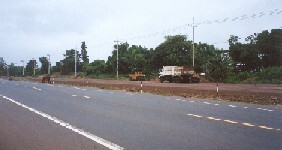 Nang Rong is one of about two-dozen districts in Buriram, and is about the size of a typical county in the eastern United States. You could probably walk from one end to the other in a single day except that the daytime temperature in Nang Rong during "the hot season" is often over 95 degrees Fahrenheit (35 degrees Celsius), and it can climb as high as 110° F (43° C) on some days. The trip from <?xml:namespace prefix = st1 />Bangkok to Nang Rong and back again was not always an easy trip by car or bus, and in fact, there are still places in Nang Rong that cannot be reached by automobile during the rainy season. 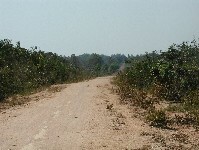 Paved, all-weather roads (roads that do not wash away in heavy rains) are a relatively recent arrival to Nang Rong. 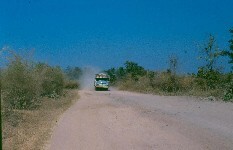 In years past, most roads were narrow, bumpy, dusty, and occasionally impassible altogether. Things certainly have changed. A far better option for those who wished to reach Nang Rong in those days was to take the train that ran through the heart of the district, carrying goods and people to and from the major cities. If you were lucky enough to live near a stop on the railroad line, and wealthy enough to afford passage, you might have gone on "thiaw," or a visit, to Bangkok and seen the glimmering golden temples and busy canals. Schoolchildren in Thailand are taught that their country resembles the head of an elephant. Nang Rong would be in the right ear of the elephant, near the bottom. Make sure that you can find the city of Bangkok and Nang Rong District on the map before going any further. Remember that these are political features that tell us how space has been divided up by humans. Political features are just one type of information that is easily summarized using maps. Transportation routes like highways, railways, and waterways are another. In many cases, transportation routes and political features are all that is shown on a map. Popular websites offering directions frequently show little else, and yet millions of people each year reach their intended destination. But maps are a much more powerful tool than that. Beyond just finding north, south, east, and west, or explaining how to get from point A to point B, maps can be used to display many types of information in an easy to understand way. ABOVE: The range of road quality has changed quite a bit in Nang Rong over the past 30 years. In recent years, the proportion of roads that are "all-weather" and paved has increased dramatically. 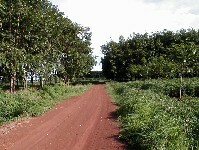 Seen here is a progression of road types ranging from a muddy, rutted, two-track to a fully finished paved highway. 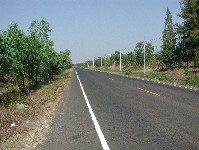 Roadways are one of many forces transforming Nang Rong.